How Is Easter Celebrated in Mexico? Posted March 20, 2018 by Roxanna Brock McDade & filed under Holidays. Easter is perhaps the most important day of the year for Christians all over the world. 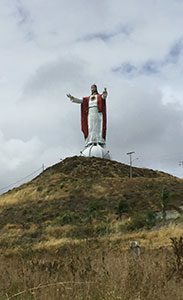 In Mexico, nearly the entire population is Christian, with 83 percent identifying as Roman Catholic and another 10 percent identifying as another Christian denomination. As a result, there is a rich culture of Easter traditions and celebrations. Easter, or Pascua as it is called in Mexico, encompasses more than just Easter Day. In fact, for children and many adults in Mexico, Easter is a two-week affair. Palm Sunday, or Domingo de Ramos, is the Sunday immediately preceding Easter Sunday. On Palm Sunday, many towns in Mexico have processions (similar to parades) in which they reenact the arrival of Jesus in Jerusalem. According to Christian tradition, Jesus rode into Jerusalem on a donkey and the people laid palm branches in front of him, so many of the Palm Sunday processions involve reenactments of this. Maundy Thursday, or Jueves Santo, is the day that commemorates the apostles washing their feet. Many in Mexico will commemorate this event by visiting seven churches, in reference to the vigil the apostles held leading up to Jesus’ arrest. Many businesses close on Jueves Santo and remain closed during Good Friday as well. Good Friday, or Viernes Santo, represents the day that Jesus was crucified. Understandably, this tends to be a solemn day, and many communities will have another procession — this time with statues of the Virgin Mary and Jesus at the center. Many communities in Mexico will use Holy Saturday to burn effigies of Judas, the apostle that betrayed Jesus. For many families, however, Holy Saturday, or Sabado de Gloria, is a day to relax with family and friends. Unlike in the United States, Easter Sunday isn’t filled with candy and bunny rabbits. Instead, most families will spend the day in Church and then have a quiet evening at home. In addition to Semana Santa, many children, and some adults, have the week following Easter off as well. During this time, many families go on trips, relax and enjoy one another’s company.